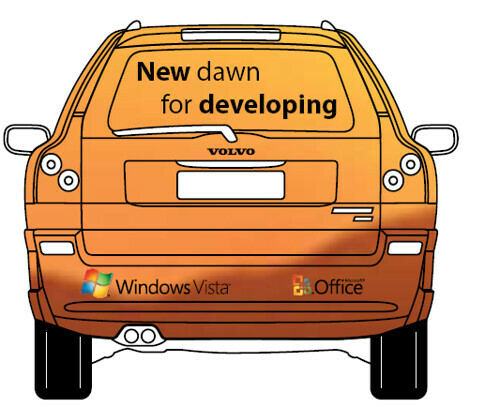 · Windows Vista’s new operating system features that your application can use. · The .NET Framework version 3.0, including support for application workflow, distributed applications and a rich presentation layer. · The new Office 2007 System and how you can access the data in documents; surface your information and create a context aware interface for your users. And what will be guiding them around the country in this intrepid expedition, none other than Windows CE in the form of a Sat Nav donated by our Partners at RoadAngel. This devices will not only guide them around the highways and byways but will also warn them of accident blackspots ensuring they get to all their presentations in one piece. They will be driving a pretty distinctive car – So if you see them, and it’s safe to do so, pull alongside and give them a wave. ...and if you attend one of the events you’ll have the opportunity to win this very Sat Nav, fully roadtested and conveniently programmed with to location of the Microsoft office and all the events venues J.
Checkout the tour site at http://ukvistaofficelaunchtour.spaces.live.com/ and follow their progress on Mark’s blog at http://blogs.msdn.com/markjo.